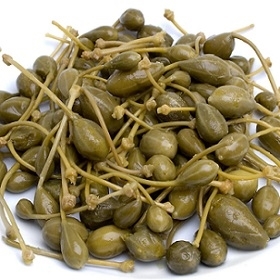 The blossomed fruit of the caper plant, these berries differ from capers in that they have a milder flavor and are less acidic. They can be added to dishes, but are also often eaten in the place of olives, and are a beautiful garnish for platters, hors d'oeuvres and alcoholic drinks. 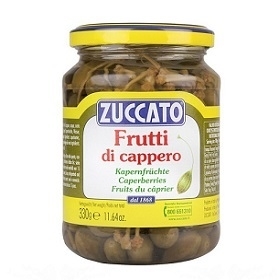 Ingredients: caper fruits, water, wine vinegar, salt.